I spent an evening inside a Blue Bear. I didn’t give it much thought. It was too strange not to. I am not an actor or have any background in performance art. I hardly knew what to do once inside the suit and cartoonish blue bear head, because I was no longer me. I was a Blue Bear. And Bears don’t talk. Even Blue ones. They Growl occasionally, and I did. 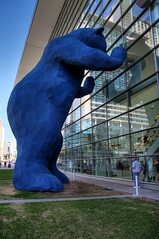 In Denver there is a giant Blue Bear sculpture staring into the performing arts center. It wasn’t that Blue Bear. It was a human sized version of it, though. 15 Minutes was putting on POP-UP Market for Create Denver Week and throughNemo I heard they were needing someone to dress up in a blue bear costume for a few hours. In a moment of playful-spirited spontaneity I said, “Oh, that’s sounds strange enough to be fun. I’m in.” All the while thinking I might be crossing over some line into true nutcase to volunteer. So after a hiccup with my Mac at the Apple Genius Bar, I raced over to 16th and Glenarm to don the Bear Suit. Turns out the Denver Cupcake Truck was making its debut – selling cupcakes as part of the art opening. Once in the Blue Bear outfit I wasn’t really able to talk, nor supposed to. I was now a performance artist, using my arms and legs, my body as a means of expressing emotion or communicating with anyone. Sounds simple enough, but have you ever considered what it is to express, to “talk” when you can’t, and when you aren’t sure how you are perceived? Most of us at least have an image of what we look like to others, if not the image we see in a mirror. Having never seen myself as a Blue Bear this was a luxury that I did not share. I was constantly imagining what I looked like or how certain moves appeared to others. Talk about getting out of your own skin. There’s, also, an interesting thing that happens with complete strangers when you are a Blue Bear. People interact with an affection akin to being around a giant puppy dog, petting or wanting to snuggle up for a hug and a picture. There were others that were downright afraid of me, as they might be of a clown. They would get the willies and run away or be on constant guard whenever I was I in view. Being a Blue Bear, above anything, gave me the opportunity to listen. Since I could not talk, and I was not me, I was some kind of silent cartoon that people would say anything around or even to. Imagine going to a cocktail party for four hours and never saying a word, only listening. That’s a bit of what it was like for me that night. I could hear the animation in a person’s voice that I would normally miss as I was preoccupied with what I might say in response. I could stand in a room and be a fly – or a giant blue bear - on the wall to numerous exchanges between friends, strangers, artists, tourists, you name it. And every once in awhile someone would come over and ask if they could have their picture taken with me. Only it wasn’t me they were asking. It was the Blue Bear. Eventually things quieted down and I was done being a bear. I went into a room, changed out of the outfit and was me again. They never knew how much I heard, how much I saw behind those bear eyes. I was a new stranger to them. Nobody noticed the man from the bear suit as he grabbed his bag, and walked out the door into the city streets, eating a cupcake from his night’s work….